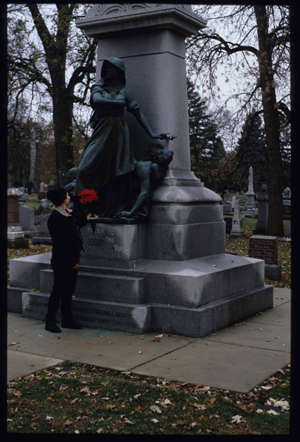 YES, I want to help restore the Haymarket Martyrs Monument. When I read that I was gutted a little bit. I reckon a lot of you reading this blog already know the story of the Haymarket Martyrs. Theirs is one of the most inspiring stories in Anarchist history in my opinion. I’ve personally visited the memorial twice now. I’d agree with that sentiment. Hell. I made two pilgrimages myself. Anyway, they are trying to raise $30,000.00 to restore the monument and insure future maintenance. They’ll even list your name in connection with the rededication ceremony planned for May Day 2011.
and for those who can deduct these sorts of things: ILHS is a 401(c)3 organization. Don’t get me wrong: I’ve been on pilgrimage there myself, and it was one of the more emotional moments of my life. I have George Engel and his last words (“Hoch Die Anarchie!”) tattooed on me. 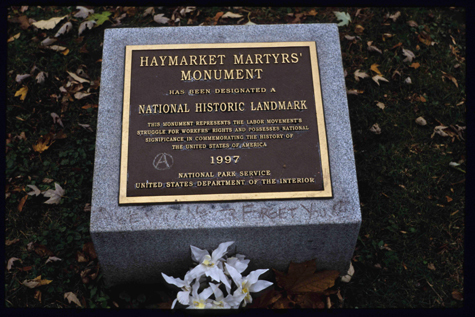 The Haymarket martyrs matter to me. But two things about this bother me. One of the plaques at the site is incredibly offensive to me, and if it were the one that was stolen I would be absolutely glad. The dominant plaque on the back of the monument is the words of the Governor who pardoned them after their deaths. I do not care one whit that the State determined after they were already dead to pardon them. I expect Mumia and Mr. Peltier will be posthumously pardoned as well. I am not an adherent of an “ancient dogma.” And the goals have not changed. We demand the abolition of wage labor, capitalism, and the stateform. $30,000 would go a long way towards maintaining existing anarchist spaces or creating new ones. The most inspiring elements of the gravesite in chicago is the “graffiti” left by the “vandals” anyhow. I’m sure there is an anarchist sculptor or metalworker who would be honored to replace the missing portions of the sculpture. As far as I can tell, Altgeld never pardoned the martyrs, he pardoned Samuel Fielden, Oscar Neebe, and Michael Schwab, who were all still alive and in prison and who were freed as a result. Even though Altgeld was (being Governor and all) far from an anarchist, his pardon was also a pretty spot-on excoriation of the frame-up of the martyrs, and he basically threw away his political career for the sake of justice. For what it’s worth, the Illinois Labor History Society has some good folks involved, or at least, the people I’ve interacted with are mostly awesome. I know a number of old Chicago Wobblies (including Franklin Rosemont) who have been involved with the ILHS. In fact, if I recall correctly, Franklin used to lead the May Day tour of Waldheim for the ILHS.